FREE ZONE Film Festival was founded in 2005 with the idea to open a space for promotion, re-thinking and understanding of current social phenomena and problems in the world, region and county through popularization of engaged cinematography rarely available as part of a regular cinematic repertoire. At the first festival in 2005, 20 documentaries, fiction feature and short films, coming from around the globe and awarded internationally, were screened in only one theatre. Now, Free Zone Film Festival screens on average 30 to 40 feature fiction and documentary films. Since 2013, the Festival is simultaneously organized in 3 cities in Serbia – Belgrade, Novi Sad, and Niš. Also, Films are screened in 10 theaters, and opening ceremony is held in Sava Center-a theater with the capacity of 3 500 seats. Continuous and interactive relationship with the audience is what also characterizes this festival not only during the festival event, but throughout the year. Namely, Documentary Thursday– monthly screenings of best documentary films in Cultural Center Rex, have resulted in steady yearly increase in the audience size, thus reaching over 20 000 visitors at the 11th edition of the Festival in 2015. In cooperation with and with the support of first local women’s foundation – Reconstruction Women’s Fund, a new program line –Women’s line was introduced and dedicated to affirmation of women’s rights. Apart from that, in 2012 the festival’s program and its team were enriched with additional selector – Guest selector. Guest selector programme represents a selection of films selected by an influential public personality whose activism and personal value system reflects values and objectives of Free Zone Festival itself. So far, Guest selectors of Free Zone Film Festival were Croatian writer Dubravka Ugrešić, art director of Dokufest, Prizren Veton Nurkollari, writer and philosopher Boris Buden, and journalist and actress Olja Bećković. Since the beginning, the Festival has also been organizing special Screenings for high-school student, the screenings which have, over time, become an important part of the festival’s program and which in 2015 resulted in creation of a new programme line- 14+. In 14+ program line, high-school students are invited to take a role of a jury and award Best Film in 14+ category. This way, young people are given the opportunity to watch films that are part of Free Zone’s selection and which, at the same time, are dealing with problems and issues of their peers nowadays and worldwide. Inspired both by Screenings for high- schools students and 14+ programme line, a separate project, called Free Zone Junior, has been created in cooperation with Association of civil education teachers. This project produced several DVD compilation editions, namely: Teacher and Student Manual for using Film as Supplementary Teaching Tool in Civic Education in Elementary and High-schools. In addition, Documentary Film Camp was organized, during which high-schools students from former Yugoslavian republics and the rest of the Balkan region had the opportunity to gather and collaborate for the first time while making their first short documentary films. Some of these student films received awards on several “senior” festivals, like Zagreb Dox, Liburnia, and Four river. For years, Free Zone also cooperates with other European festivals showing documentary and fiction films, and has travelled, with its best film selections, to various festivals: Marseille’s International Film Festival, Dokufest in Prizren, Tempo Documentary Festival in Stockholm, This Human World in Vienna, and CPH: DOX in Copenhagen during which also a collaboration was eloped by organizing a special screenings oted to 25th anniversary of the fall of Berlin wall. Program that additionally contributed to the visibility of Free Zone and interaction with its audience is debate programme Late night conversations. As a festival focused on engaged film emphasizing social issues and phenomena, numerous philosophers, social and political theorists and those working in the field of art re-think and discuss subjects covered by films and questions they raise during this festival activity. Following the trends in contemporary film production, Free Zone has created an accompanying program Cross Media Zone in 2014, and oted it to engaged documentary and fiction projects that combine activism and state of the art digital technology with film expression. 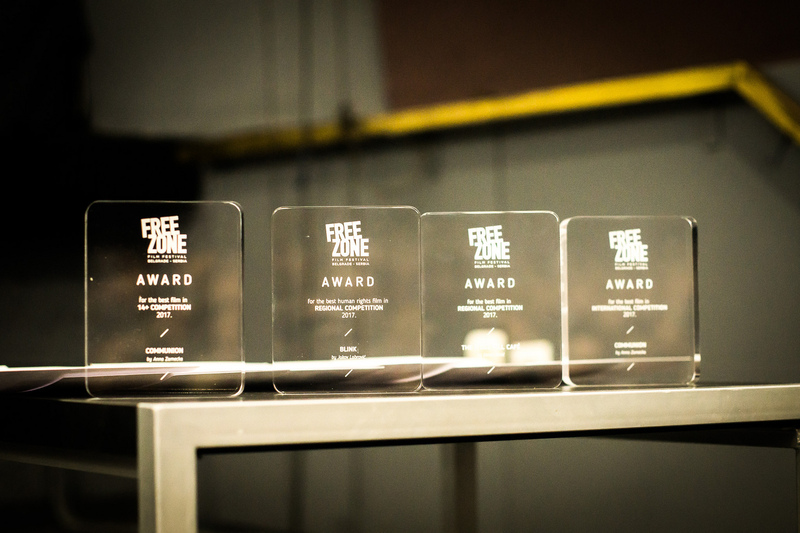 Since 2016., Free Zone jury consisting of experts awards Best engaged film in Regional competition, Human Rights Award and award for Best film in (youth) selection 14+ (awarded by high-school jury). Also, there is Audience award– which is awarded for four films based on audiences’ votes and for which rights for TV screening are bought. These films are then shown on TV following year in October, a month preceding upcoming festivals edition. In all categories, documentary and fiction films are equally competing. Especially interesting is Award for the audience, which goes to author of best film review. So far, festival was opened by Mirjana Karavnović, Miki Manojlović, Biljana Srbljanović, Veran Matić, Boris Buden, Dubravka Ugrešić, Olja Bećković, Viktor Ivančić, Teofil Pančić. After the festival in November, Free Zone Tour is organized in spring (in April, May and June), during which the audience from other cities, towns and villages in Serbia is given the opportunity to see 5 to 7 of the best films from the previous edition of the festival. In 2016, 10th Free Zone Tour was organized and more than 45 cities were visited. At the same time, Free Zone Tour represents example par excellence of cultural decentralization by showing high quality film programme to the audience in smaller cities. Project Free Zone Film Festival is a member of International Network of Film Festival on human rights – Human Rights Film Network, as well as a partner in Balkan Documentary Distribution Network, together with organizations and its festivals from the region: ReStart from Zagreb, Docufest from Prizren, Demiurg from Ljubljana, and Underhill from Podgorica.